Then God said 'And now we will make human beings, they will be like us and resemble us'. 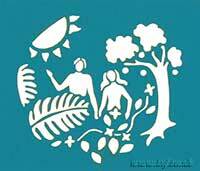 A small laser cut card in a light weight dark coloured card with Adam and Eve in the garden scene cut out. The folded card is 105mm wide by 90mm high.